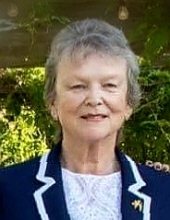 Pat Rolinger, 83 of Midwest City, Oklahoma died on March 21, 2019 at her home surrounded by her family .She was born on February 22, 1936 to Paul C. Roe and Bessie Bond Nichols. She married the late James Rolinger, her high school sweetheart and love of her life in 1952.They were married for 63 years until Jim’s passing in March of 2016. Together, they, with their children traveled to Morocco, Spain, Thailand, Japan, and multiple places throughout the United States. They settled in Midwest City, Oklahoma after Jim retired from the Air Force. She was a multitalented strong woman. She was a wife, mom, friend, artist, musician, teacher, and beautician to name a few of her many talents. Pat is survived by her three children, Jill Hinkston (Wes), Steve Rolinger (Julie), and Kim Rehl (Gary), 6 grandchildren, and 8 great grandchildren with one coming in May. She is preceded in death by her parents, her loving husband, her infant twins, and her great grandson. Pat was extremely proud of her family and leaves behind many beautiful memories. Graveside services will be held at Arlington Memory Gardens at 3:00 p.m. Thursday, March 28, 2019. To send flowers or a remembrance gift to the family of Pat Rolinger, please visit our Tribute Store. "Email Address" would like to share the life celebration of Pat Rolinger. Click on the "link" to go to share a favorite memory or leave a condolence message for the family.